Samuel Beckett is not often thought of as a London writer, but Murphy (1938), his first published novel, is firmly set in the capital, performing, even as it parodies, the topographical mappings by which realistic fiction gives to airy nothing local habitations and names. Beckett came to London from Dublin late in 1933 to seek psychoanalysis, which was then illegal in Ireland, and began a course of therapy with Wilfred Bion at the Tavistock Clinic in Malet Place which would last for two years. 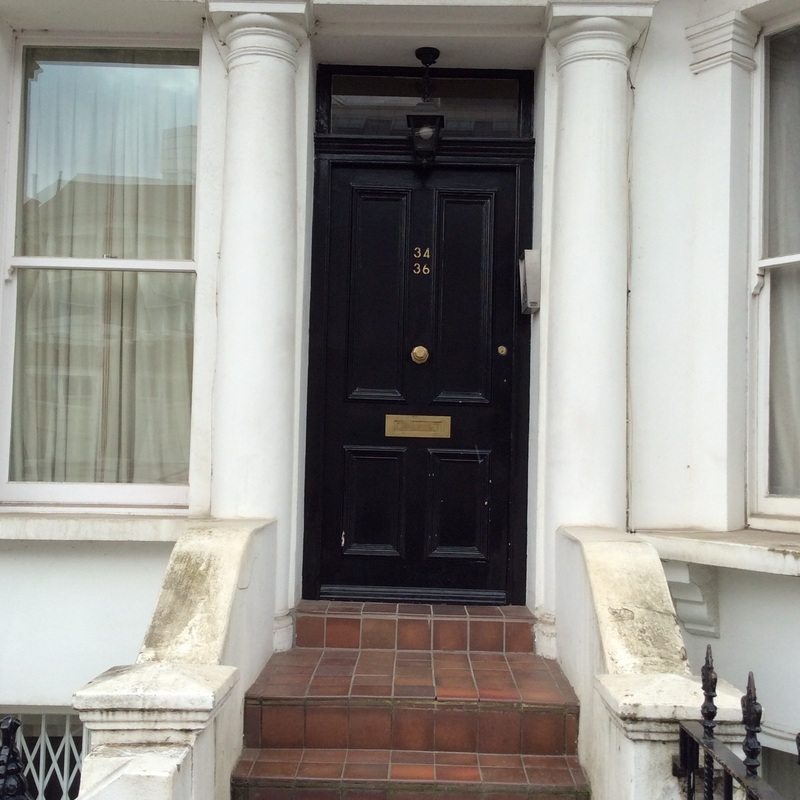 He lived in Chelsea, first at 48 Paultons Square for seven months in 1934 and then at 34 Gertrude Street. 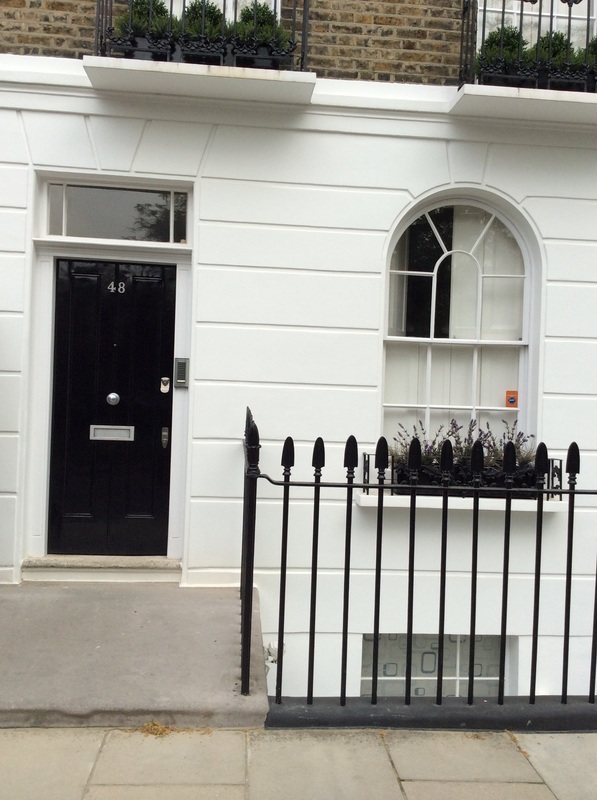 On 19 April 2016 two blue plaques were unveiled at 48 Paultons Square, one to Beckett, the other to a fellow Nobel Prize winner, the physicist Patrick Blackett, who lived there from 1953-69 (see link in “Web sources” section below). She had turned out of Edith Grove into Cremorne Road, intending to refresh herself with a smell of the Reach and then return by Lot’s Road, when chancing to glance to her right she saw, motionless in the mouth of Stadium Street, considering alternately the sky and a sheet of paper, a man. Murphy. 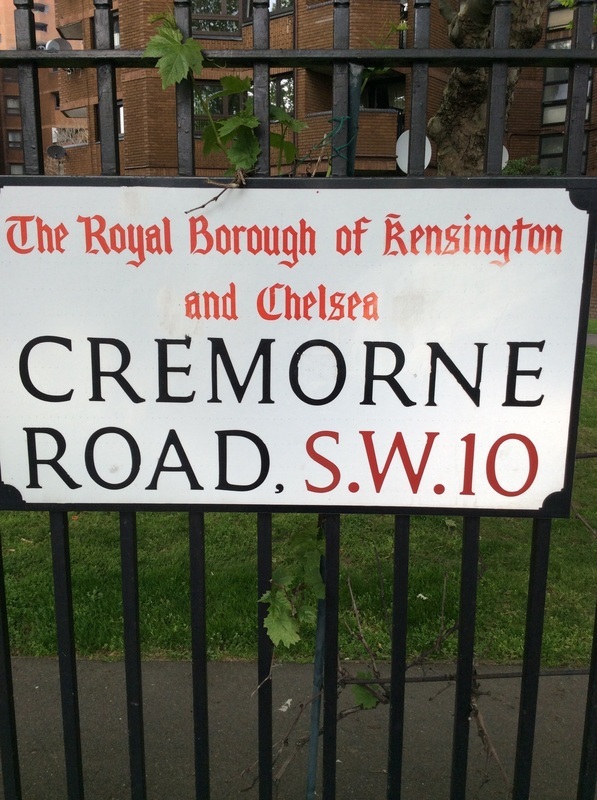 Celia’s route from Edith Grove to Cremorne Road past Stadium Street, like the other itineraries in the novel, can still be traced on an A-Z and on foot - you can even still catch a (not wholly aromatic) smell of the Reach. Mr Willoughby Kelly, Celia’s wheelchair-bound paternal grandfather, to whom Celia is giving the account of her meeting, objects to what he calls ‘[a]ll these demented particulars’ and beseeches her to ‘be less beastly circumstantial’, protesting that the ‘junction for example of Edith Grove, Cremorne Road and Stadium Street is indifferent to me’. But the particulars continue as Celia reaches the Chelsea embankment, walks ‘to a point about half-way between the Battersea and Albert Bridges and [sits] down on a bench between a Chelsea pensioner and an Eldorado hokey-pokey man, who had dismounted from his cruel machine and was enjoying a short interlude in Paradise’. Artists of every kind, writers, underwriters, devils, ghosts, columnists, musicians, lyricists, organists, painters and decorators, sculptors and statuaries, critics and reviewers, major and minor, drunk and sober, laughing and crying, in schools and singly, passed up and down. Barges and a tug move on the river and the ‘clock of Chelsea Old Church gr[inds] out grudgingly the hour of ten’. 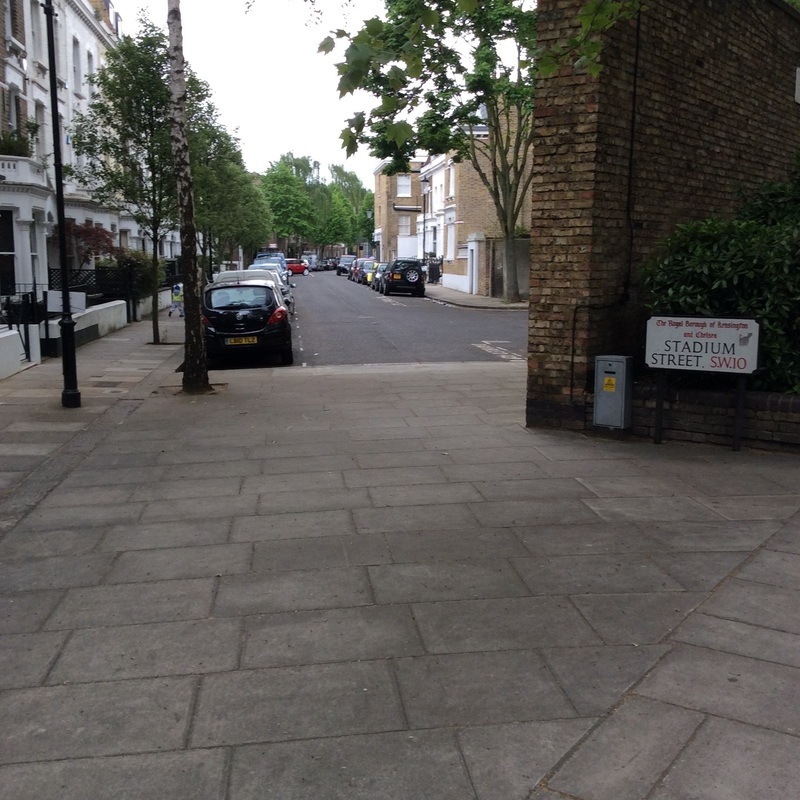 Celia sets off to return via Lot’s Road but is drawn back into Cremorne Road and then to Stadium Street where Murphy still stands – though he has dropped the sheet he has been holding, which is ‘the star chart for June’. On the following Sunday, prompted by auspicious astrological signs, Murphy proposes to Celia ‘in the Battersea Park sub-tropical garden, immediately following the ringing of the bell’. Celia accepts. Murphy lives in West Brompton, in a condemned mew – Beckett carefully eschews the more usual ‘mews’ for the singular ‘mew’, originally signifying a cage or building for trained (especially moulting) hawks and also, as a verb, meaning ‘to confine in a restricting place or situation’ – as in the expression ‘to mew someone up’. Murphy’s situation, at the start of the novel, might indeed seem restrictive – he sits naked in a rocking-chair, held in position by seven self-tied scarves, able to make ‘[o]nly the most local movements’. Here he anticipates later, more minimalist Beckett figures, confined in cangs (The Unnamable) or dustbins (Endgame) or earth mounds (Happy Days). But for Murphy, the narrator assures us, this restriction is pleasurable, appeasing his body and freeing his mind. It helps him to attain what is later called ‘that self-immersed indifference to the contingencies of the contingent world which he had chosen for himself as the only felicity and achieved so seldom’. Clearly, however, Murphy’s indifference to the contingent world creates a problem for Celia, who does not want to go back on the street: he will not work. ‘He begged her to believe that he was a chronic emeritus’. Whereas, in a social-realist novel of the 1930s, unemployment might well be the problem, the problem here is employment. Indeed, Murphy, resurrected today, might seem to confirm twenty-first-century notions of the workshy immigrant in the English capital. But Murphy makes a deal with Celia that if she gets a horoscope from a swami in Berwick Market, he will start work on the day it indicates. When Celia duly does so, however, Murphy interprets the horoscope as advising that he should start work on the ‘very first fourth to fall on a Sunday in 1936’ – which means he does not have to get work for over twelve months, since it is now 12 September 1935, and the first time the fourth falls on a Sunday in 1936 is 4 October. Exasperated, Celia threatens to walk out, so Murphy reluctantly agrees to seek work. Meanwhile, back in Dublin, Murphy’s former mentor, Neary, has fallen for one of Murphy’s ex-girlfriends, Miss Counihan. She rejects Neary, however, because she firmly believes that Murphy will come back for her. There has been no news of Murphy in the English capital except for a sighting of him ‘on Maundy Thursday late afternoon, supine on the grass in the Cockpit in Hyde Park’ – a location that will recur in the novel. The Cockpit, on the north side of the Serpentine, is an old gravel pit that became a grass amphitheatre and features most famously in the history of popular culture as the venue for the Rolling Stones’ ‘Stones in the Park’ concert of 1969. But in fiction, Murphy, the ‘seedy solipsist’, was there earlier. Neary has sent his factotum, Cooper, to seek Murphy in London. Cooper briefly finds him, then loses him again. Neary’s friend Wiley advises Neary himself to ‘[l]eave tonight for the Great Wen’ – William Cobbett’s name for London – and Neary later does so. Wiley and Miss Counihan follow suit, taking Cooper, who has briefly returned from London to Dublin, back with them. So all the Irish characters end up in London in a semi-comic pursuit of Murphy. In London, Celia finds a new room for Murphy and herself ‘in Brewery Road between Pentonville Prison and the Metropolitan Cattle Market’. Murphy sets out ‘on the jobpath’ but tends ‘to abandon hope for the day shortly after lunch and set off on the long climb home’. ‘By far the best part of the way was the toil from King’s Cross up Caledonian Road […] At the top there was the little shelter like a head on the pimple of Market Road Gardens opposite the Tripe Factory. Here Murphy loved to sit’. In winter, however, the gardens close earlier and Murphy then ‘put[s] in the time walking round and round Pentonville Prison. Even so at evening he had walked round and round cathedrals that it was too late to enter’. Pentonville Prison (of course) and Market Road Gardens are still there today and the Tripe Factory, or some variant of it, seems to have still been present over 20 years later - the 1959 report of Islington’s Medical Officer of Health lists, among the ‘respective offensive trades in the Borough’, two tripe boilers at 14/18 Market Road. Murphy applies to a Gray’s Inn Road chandlery that requires a ‘smart boy’, but is smartly rejected. He takes his fourpenny lunch at a café in the same road and, closing his eyes, plots his route to the Cockpit in Hyde Park – a mental perambulation akin to that of the imaginary excursion of a fiction reader. His inner journey has taken him as far as the Harpy Tomb in the Archaic Room of the British Museum, when Austin Ticklepenny, whose visiting card styles him ‘Pot Poet / From the County of Dublin’, interrupts his reveries. Ticklepenny has been working for a week as a male nurse at the M.M.M. – the Magdalen Mental Mercyseat – but wants to give up the job because he fears contact with the mad will drive him crazy. Murphy offers to visit the M.M.M. next Sunday morning and take over Ticklepenny’s job. He then departs, leaving Ticklepenny to pay the bill, feeling he has ‘earned the long rapture flat on his back in that most pleasant of natural laps available, the Cockpit in Hyde Park’. Murphy takes a twopenny bus ride to Marble Arch – he adores ‘the new six-wheelers’ with their ‘deep oversprung seats’ – and walks across Hyde Park. Near the Cockpit he sees ‘a guffawing group […] watching Rima being cleaned of a copious pollution of red permanganate’. Rima was the controversial bas-relief carved by Jacob Epstein in 1922 and forming part of the W. H. Hudson memorial garden from 1925. The carving shows Rima the Jungle Girl, the heroine of W. H. Hudson’s novel Green Mansions: A Romance of the Tropical Forest (1904), bare-breasted in a Modernist Primitive style. According to Matt Brown on the Londonist website, Rima had twice been vandalized in the 1920s – daubed with green paint in 1927 and tarred and feathered in 1929 - and continued to be attacked until World War Two. The carving is still visible today though a railing and lawn distances it from the viewer and vandal. Left alone in the Cockpit, Murphy ‘lapses into consciousness’ (which would more usually be thought of as unconsciousness). He comes back to his surroundings to find ‘night fallen, a full moon risen, and the sheep gathered round him, a drift of pale uneasy shapes’. He thinks of ‘the four caged owls in Battersea Park, whose joys and sorrows did not begin till dusk’ (74). When he gets back to Brewer Street and Celia, he finds ‘a shocking thing’ has happened. The old man who lived in the room above them has cut his throat and died in the ambulance on the way to hospital. Murphy becomes annoyed at Celia’s distress, however, and at her response – a mere ‘Oh’ – to the news that he has found a job. He goes out and does not return for several days. She took the Piccadilly tube from Caledonian Road to Hyde Park Corner and walked along the grass north of the Serpentine. Each leaf as it fell had an access of new life, a sudden frenzy of freedom at contact with the earth, before it lay down with the others. She had meant to cross the water by Rennie’s bridge and enter Kensington Gardens by one of the wickets in the eastern boundary, but remembering the dahlias at Victoria Gate she changed her mind and bore off to the right into the north, round the accident house of the Royal Humane Society. The Royal Humane Society had been founded in 1774 to revive people who were drowning and the ‘accident house’ was its first depot, or ‘Receiving House’, originally built in 1794 to help people who got into difficulties swimming in the Serpentine or skating on its surface when it froze. A new Receiving House, designed by Decimus Burton, was built in 1844 and destroyed by enemy bombing in World War Two. Cooper, stationed in the Cockpit that is known to be Murphy’s haunt, sees Celia and starts to follow her. She walks to the Round Pond and sits on a bench to watch the kite flyers - one kite, ‘after prolonged paroxysms’, comes down ‘behind the cast of the Physical Energy of G. F. Watts, O.M., R.A.’, still a key feature of Kensington Gardens today. But Mr Kelly does not appear: ‘[s]oon the gates would close, all over the gardens the rangers were crying their cry: All out’ . This cry will echo at the end of the novel. Celia returns to Brewery Road to find Murphy has called in her absence to collect his bag. He has gone to work as a nurse at the M.M.M., taking over from Austin Ticklepenny. According to James Knowlson in his 1996 biography of Beckett, ‘much of Beckett’s description of the “Mercyseat” corresponds to the actual location, lay-out and appearance of the real Bethlem Royal Hospital’. Murphy’s is a live-in job that gives him a garret on the premises. In a scene that will be significant for his later fate, he insists that he ‘must have fire’ in his unheated garret and Ticklepenny, after some effort, brings in an old gas radiator that he connects by a pipe improvised from used feed tubes and glass to a gas jet in the lavatory below which is supposedly controlled by a chain-and-ring switch that appears to turn itself on and off unpredictably. Murphy proves an effective nurse because of his identification with the patients; he feels that most of them, except the manic ones, have achieved that indifference to contingency that he himself desires. He feels particular sympathy with Mr Endon, his ‘tab’ – a ‘tab’ is a patient ‘“on parchment” (or “on caution”)’ because he appears to have ‘serious suicidal leanings’. Mr Endon is ‘a schizophrenic of the most amiable variety’ who presents ‘a psychosis so limpid and imperturbable that Murphy felt drawn to it as Narcissus to his fountain’. His ‘one frivolity’ is chess. Meanwhile, Miss Counihan finds lodgings in Gower Street, ‘almost opposite the offices of the Spectator, but she did not discover this until it was too late’. It is here that she ‘cower[s], as happy as the night was short, in the midst of Indians, Egyptians, Cyprians, Japanese, Siamese and clergyman’. This is the only extended reference in the novel to ethnicities in London other than the Irish. Miss Counihan, Wylie and Neary go together to find Murphy at his Brewery Road address but meet Celia instead, who tells them the story of her relationship with Murphy. On Saturday 19 October, on his afternoon off, Murphy returns to Brewery Road – Celia is out – to collect his rocking chair. Back at the M.M.M., he is on night duty for the first time and plays a strange and comic game of chess with Mr Endon in which neither party strives to win; the moves are laid out as in a chess book with pastiche commentary – for example, move 15, ‘K-Q1’ is annotated ‘Never seen in the Café de la Régence, seldom in Simpson’s Divan’. After move 43, Murphy resigns, though there is no need to. Soon afterwards, he returns to his room, lights his candle (which stands upright on the floor in its own wax), ties himself up in his rocking chair, and starts to rock to quieten his body; the gas in the lavatory below comes on and starts to seep upwards through the improvised pipe. Murphy’s earlier demand for fire will indeed be realized when the gas and candle flame meet. Celia, Miss , Cooper, Neary and Wylie go to the M.M.M. where Celia identifies Murphy’s badly burnt body and Neary reads out Murphy’s note to her asking that his ashes be flushed down the toilet at Dublin’s Abbey Theatre, if possible during a performance. If this last request implies a return to Ireland, the ashes never make it; Cooper throws the bag containing them at a man in a London pub who has much offended him. In the ensuing melee, the ashes are ‘freely distributed over the floor of the saloon’ and soon after swept away with the other refuse. The last chapter of Murphy returns to Hyde Park, where Celia wheels out Mr Kelly to fly his kite in the late afternoon. As closing time draws near, the ‘wail of the rangers’ comes ‘faintly out of the east against the wind. All out. All out. All out’, and Celia starts to push Mr. Kelly home, ‘All out’, repeated once more, provides the last words of the novel. The phrase seems to anticipate Cyril Connolly’s famous valediction, eleven years later, in the last issue of his magazine Horizon – ‘[i]t is closing time in the gardens of the West’ – and Beckett’s own progressive evacuation of ‘demented particulars’ from his later prose and drama. But at this stage of Beckett’s career, Murphy holds London particulars and the mind, the empirical and the metaphysical, in a relationship that is comically inventive, philosophically engaging and precisely metropolitan. Ackerley, Chris, Demented Particulars: The Annotated Murphy (Oxford: Oxford University Press, 2010). Beckett, Samuel, Murphy, Jupiter Books (London: John Calder, 1970). Knowlson, James, Damned to Fame: The Life of Samuel Beckett (London: Bloomsbury, 1996).